Starting in 2006 and lasting through 2011, Syria suffered the worst long-term drought and the most severe set of crop failures in recorded history. In a new research paper, I’ve looked at the role of regional drought, unsustainable water management policies, and climatic conditions in contributing to the severe conflict in Syria in the past few years (see the peer-reviewed paper “Water, Drought, Climate Change, and Conflict in Syria” by Dr. Peter H. Gleick, coming out in the July issue — and here online — in the American Meteorological Society journal Weather, Climate, and Society. A press release on this paper is now available, here). Many factors influenced the civil war in Syria, including long-standing political, religious, and ideological disputes; economic dislocations from both global and regional factors; and the consequences of water shortages influenced by drought, ineffective watershed management, and the growing influence of climate variability and change. The drastic decrease in water availability, water mismanagement, agricultural failures, and related economic deterioration contributed to Syria’s population dislocations and the migration of rural communities to nearby cities. These factors further contributed to urban unemployment, economic dislocations, food insecurity for more than a million people, and subsequent social unrest. Key to mitigating risks in the region are improvements in water-use efficiency and productivity in agriculture, better management and monitoring of groundwater resources, and comprehensive international agreements on managing and sharing the rivers that cross political borders. There is a long history of conflicts over water in the Middle East (this history can been seen in the Water Conflict Chronology, published online by the Pacific Institute). The region experiences high natural variability in precipitation and suffers from a lack of modernized agricultural and water management systems. Less than one-fifth of Syria’s irrigated area uses modern sprinklers or drip irrigation. Half of all irrigation water comes from groundwater systems, which are in a condition of overdraft, leading to dropping groundwater levels and rising production costs. Water use and the construction of large water infrastructure upstream by Turkey have also decreased surface water supplies flowing into Syria (see Figure). Populations in the Tigris-Euphrates river basins have grown rapidly, further stressing limited water supplies. All of these factors were worsened by severe multi-year drought. Figure. Discharge of the Euphrates River measured at Jarablus, Syria from the mid-1930s to around 2010. 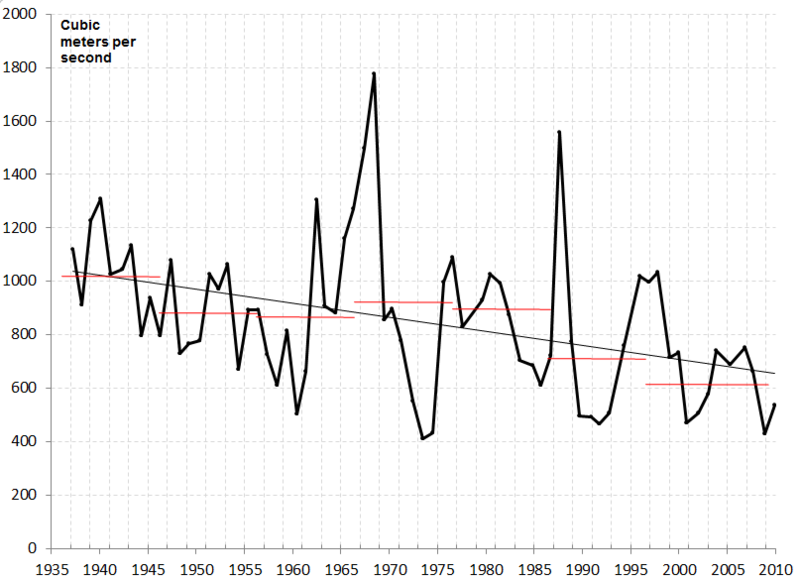 Red lines show the decadal averages. The long-term linear trend is also shown. Data from the United Nations Economic and Social Commission for Western Asia, 2013. Assessing the role of climatic changes in altering water availability finds growing evidence that drought frequency and intensity in the Levant/Eastern Mediterranean region have changed from historical climatic norms. Researchers have identified an increasing tendency in annual and seasonal drought intensity corresponding with an increasing number of dry days in the rainy season, and there is evidence that climate changes are already beginning to influence droughts in the area by reducing winter rainfall and increasing evapotranspiration at rates higher than can be explained by natural variability alone. In the face of this, there are viable options for reducing the risks of water-related conflicts in the region, including expansion of efficient irrigation technologies and practices, integrated management and monitoring of groundwater resources, and diplomatic and political efforts to improve the joint management of shared international watersheds and rivers. And as global warming worsens, populations increase, and pressures on water grow, efforts to reduce conflicts over water will have to expand and improve.